The Tissot company was founded by father and son Charles Félicien and Charles-Emile Tissot in 1853, in Le Locle Switzerland, and hasn’t moved from there ever since. 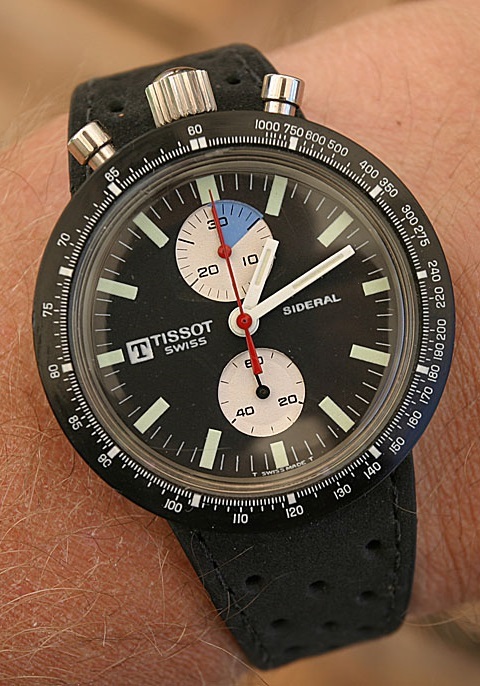 Today it is a member of the Swatch Group, the world’s largest watch producer and distributor. 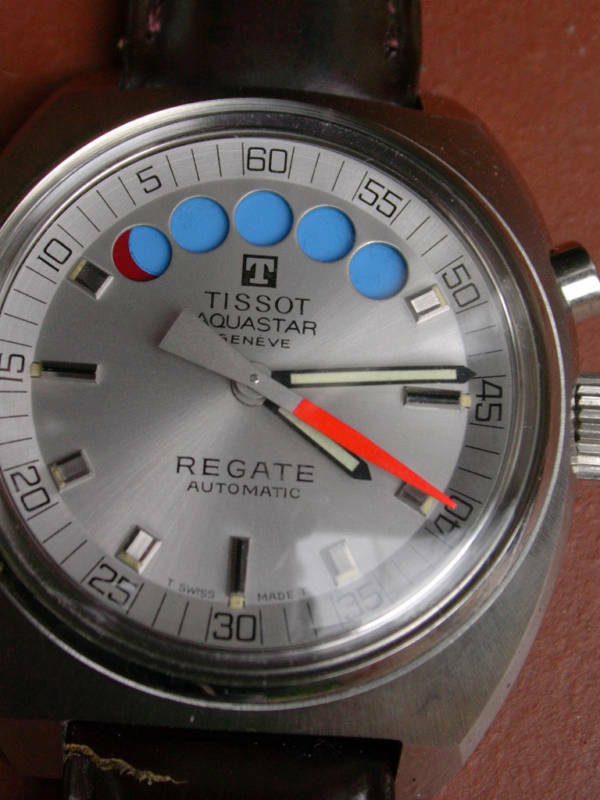 Tissot was the first watch company who developed a watch in the late 1960’s with a fiberglass case, dial and bezel: the Sideral with regatta countdown indication. 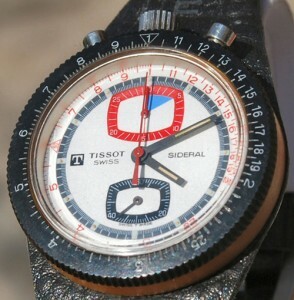 Several versions of the Tissot Sideral. The S in ‘Sideral S’ stands for Sport. In 1930 both watch brands Omega and Tissot united in an important Swiss Watch Group, the Société Suisse pour l’Industrie Horlogére SA (SSIH). 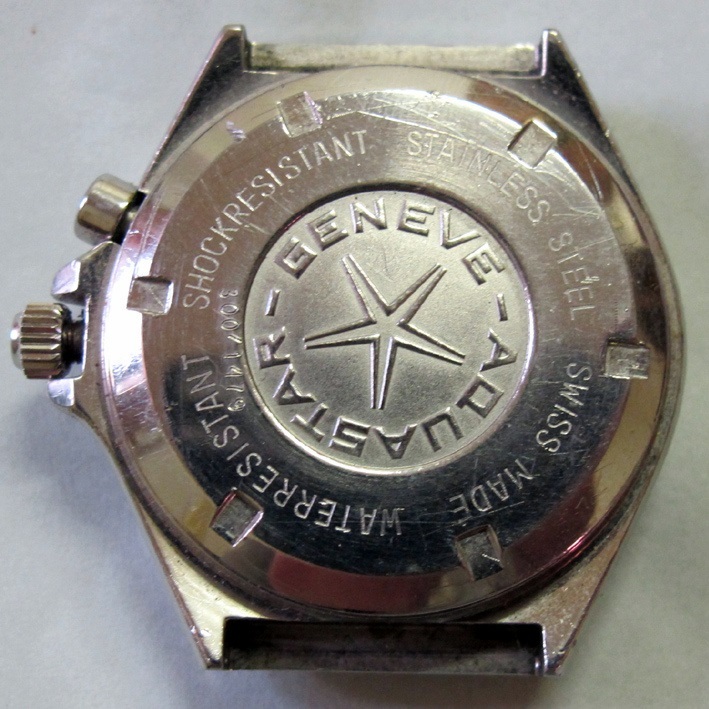 Both remained independent, and in 1932 also Lemania joined. 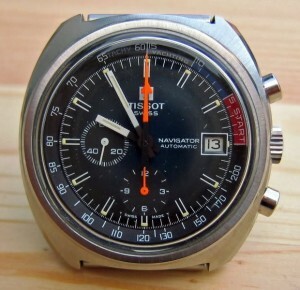 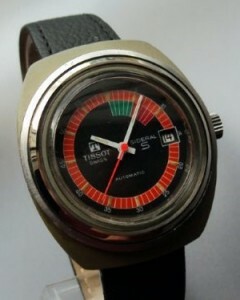 In the seventies also Tissot was hit severely by the quartz crisis. 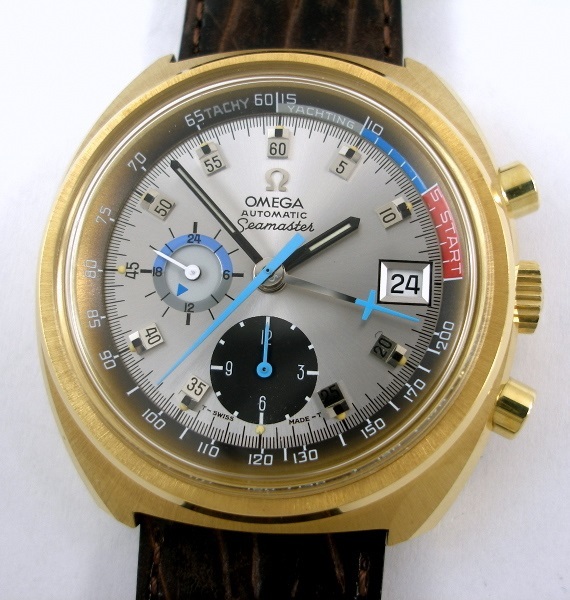 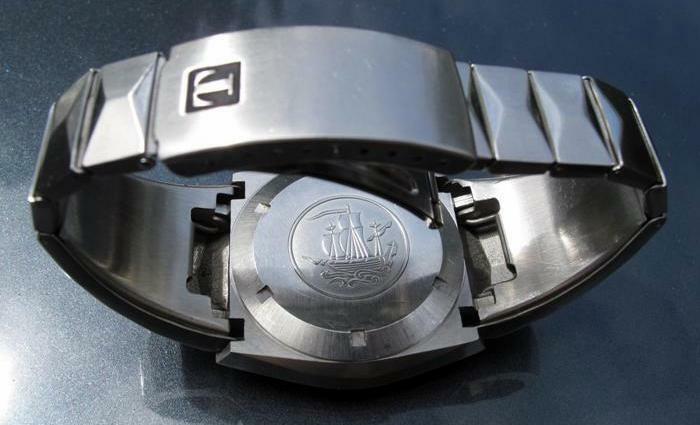 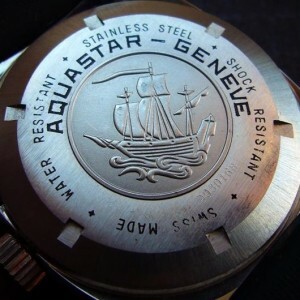 Eventually the rescue was brought in 1985 by the merger of the SSIH and the ASUAG (Allgemeine Schweizerische Uhren AG) into the Swatch Group, which led to an extensive reorganization of the Swiss watch industry and the opening up of new markets. 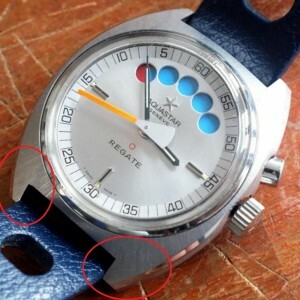 For this reason it is understandable that Lemania movements appeared in watches of all three brands. 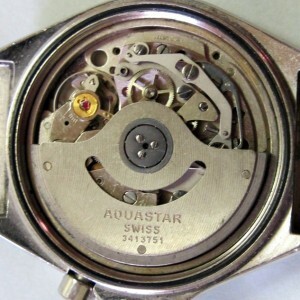 And Lemania did not only deliver the movements, but often also the cases. Two examples for Tissot are the Navigator Yachting (with the Lemania 1341 movement) and the Regate (with the Lemania 1345 movement). 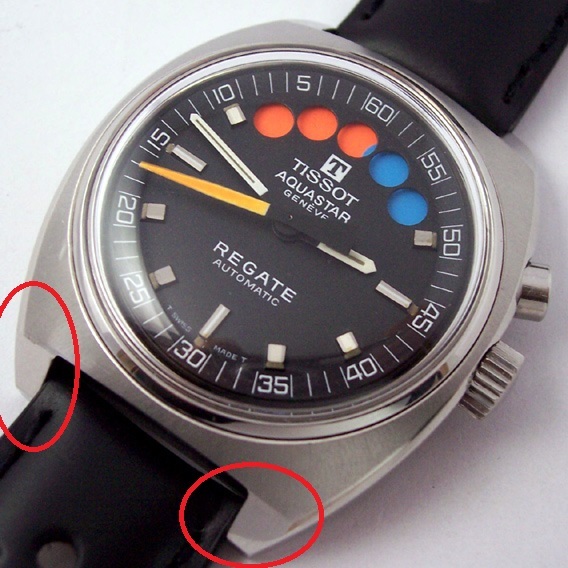 Tissot Navigator Yachting and Omega Seamaster Yachting. 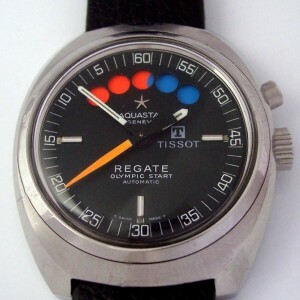 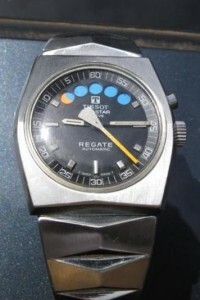 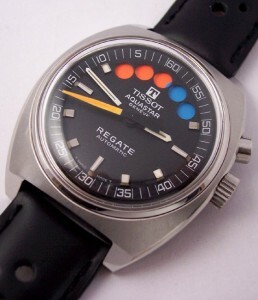 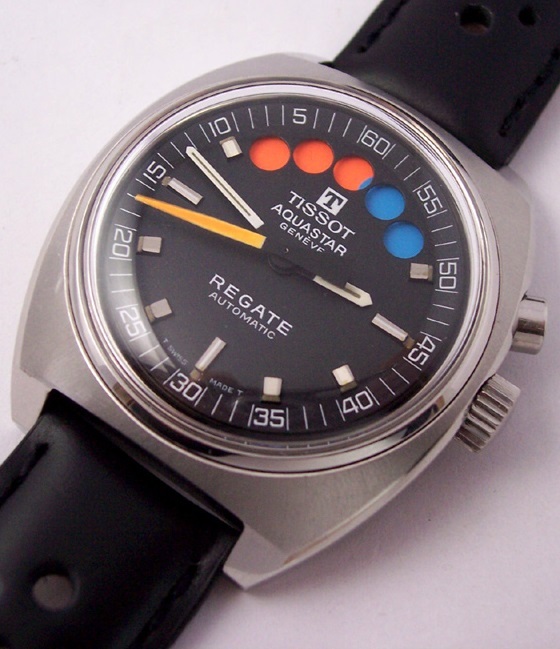 When in the 1970’s Tissot introduced their version of the Regate with the Lemania 1345 regatta movement, the dials were branded both Tissot and Aquastar. 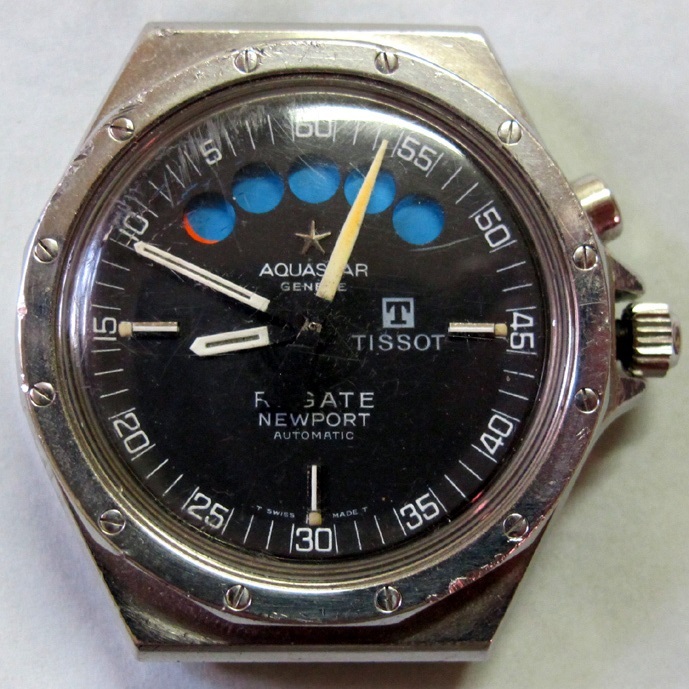 It came available in the same but slightly modified Aquastar 2-piece-case or the one with the Lobster bracelet, both cases either with a silver or a black dial. Tissot Regate with black dial, silver dial and black dial with Lobster bracelet, all co-branded Aquastar. Reference: unknown, several versions, with silver or black dial. 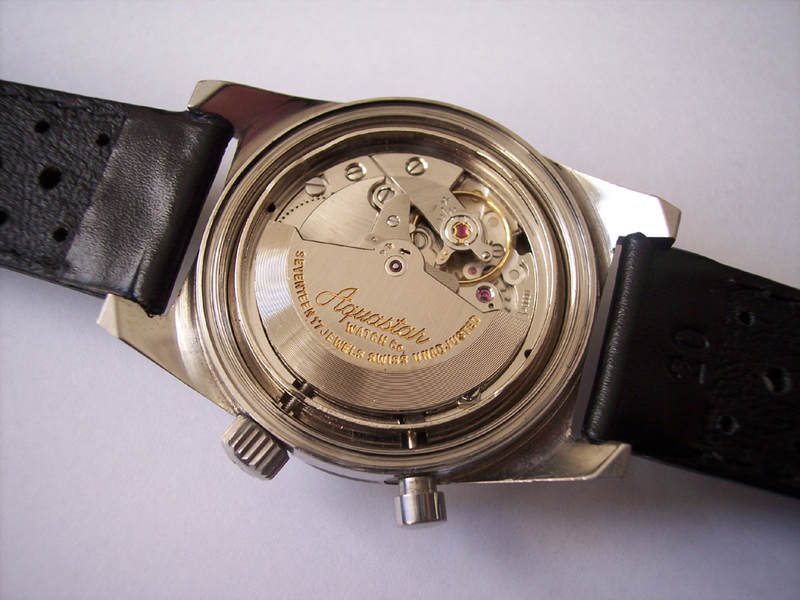 Caliber: automatic Lemania 1345 flyback movement. 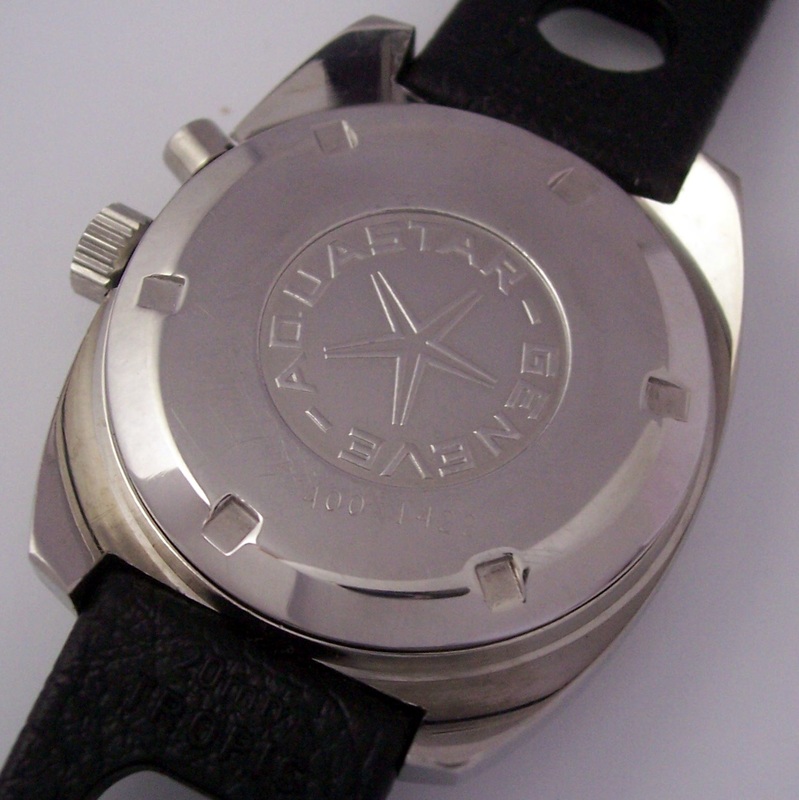 Round case size: Ø 38,7 mm / H 15,6 mm. 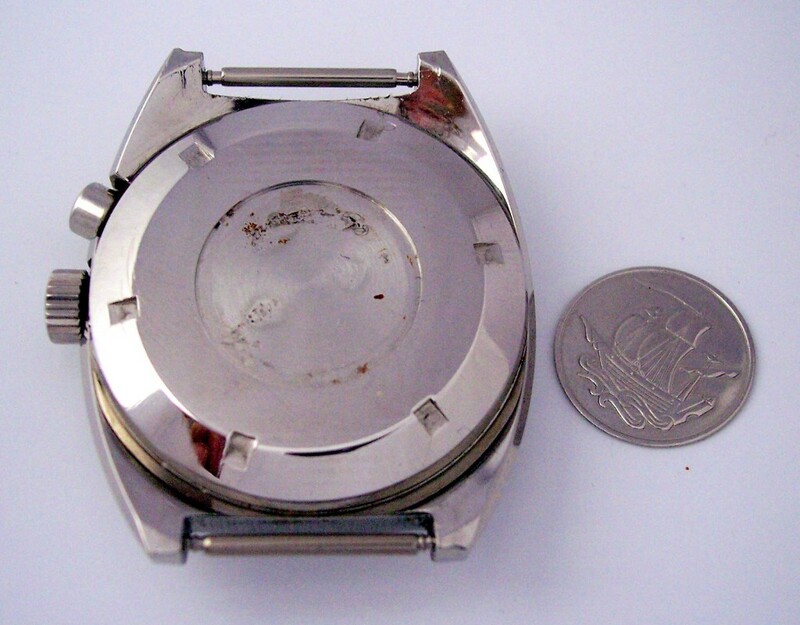 Lobster case size: 39,3 x 41,2 mm / H 15,4 mm. The Spanish Galleon on the caseback is not engraved, but glued as a circular inlay upon it. This means it can come loose with an ultrasonic cleaning. 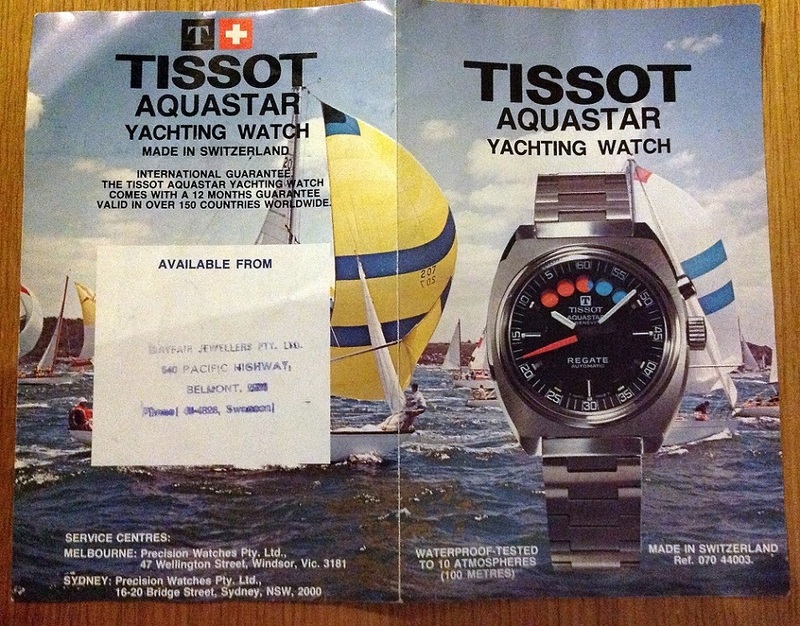 Australian brochure for the Tissot-Aquastar Regate. 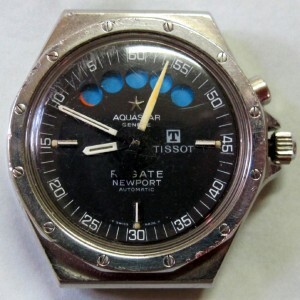 To read more about the Aquastar Regate models and the Lemania 1345 movement, please visit the Aquastar 1970’s section here. Many thanks to Kevin van der Zouwen for your help with the Tissot information. 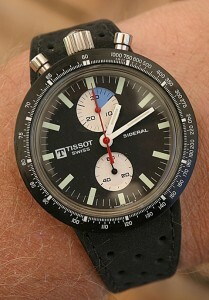 Many thanks to Richard Askham for sending me your pictures for this section. 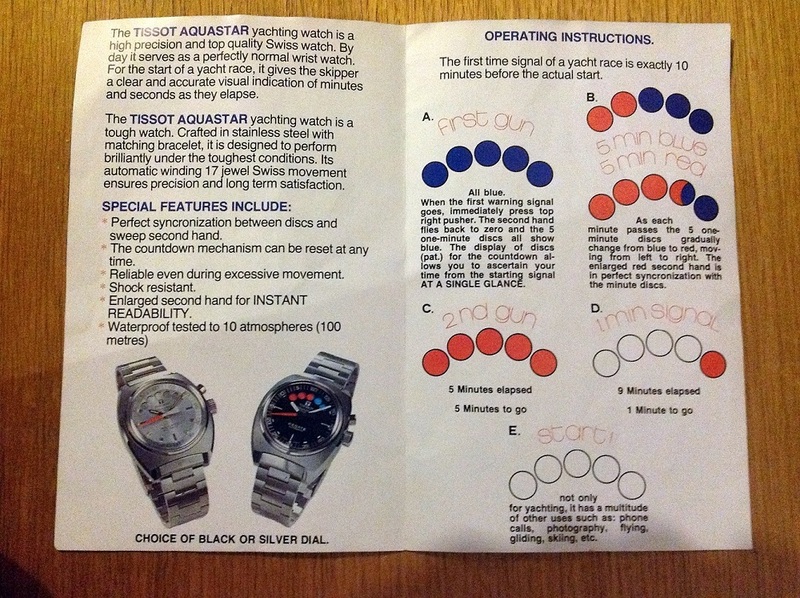 Many thanks to Earthbling1 for sending the pictures of your brochure to me.